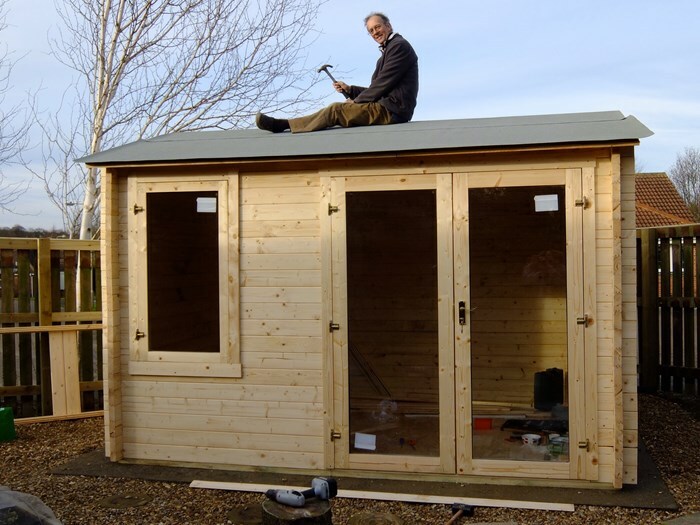 The Devon Log Cabin is a premium garden building that you can be proud of. 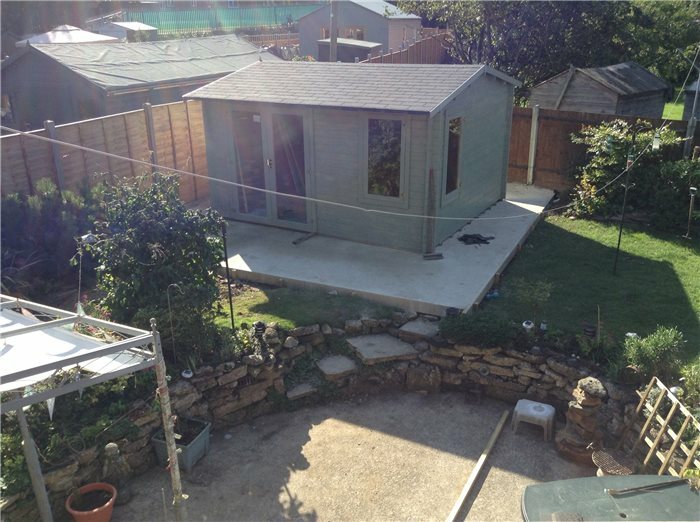 With the option of classic looking Georgian windows or Modern style windows, this range of cabin is a much more affordable alternative to a home extension and will be a characterful centrepiece of your garden. 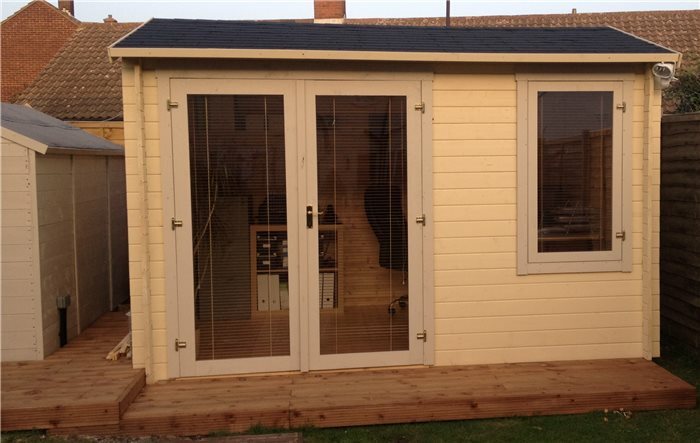 Whether you’re looking for an attractive summer house, home gym or even want to remove the need to commute to work by building a home office, with a choice of 28mm, 35mm or 44mm thick walls available in a range of versatile sizes, the Devon range will accommodate your every desire. The 6’2” high reaching offset double door design is a unique feature that maximises the potential of your inner space allowing you to fully utilise the cabin however you want to. 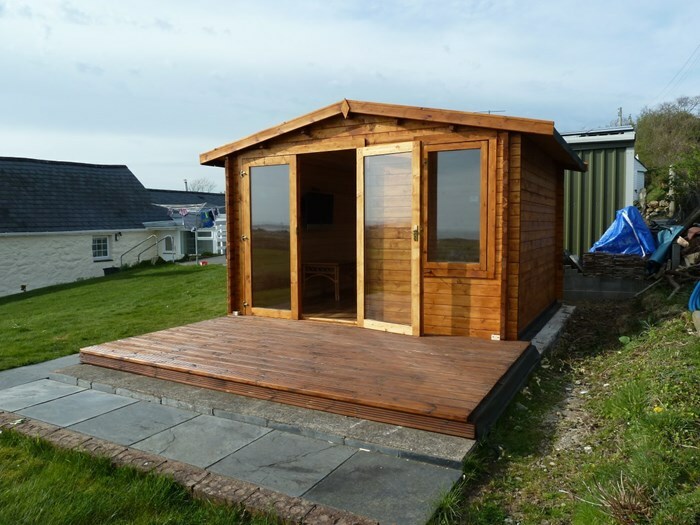 If you’re searching for a cost-effective, creative way to extend your living space then a BillyOh Devon log cabin is the ideal solution, and is much cheaper and quicker than building a conservatory. 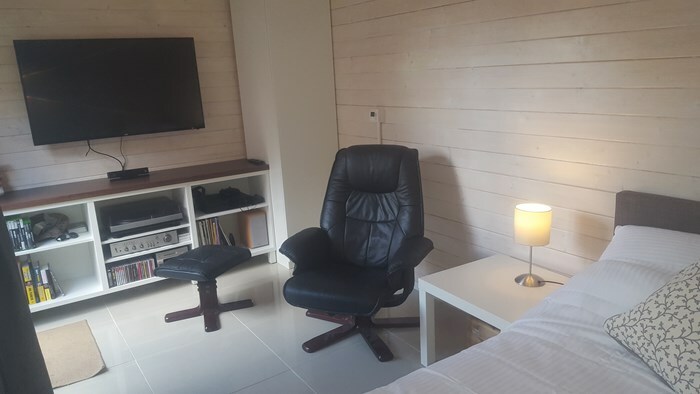 Easily used as a games room to enjoy with family or friends or a summerhouse for unwinding and relaxing, a premium log cabin is completely versatile meeting all your needs. The Devon range is designed with your comfort and satisfaction in mind, enabling you to spend more time outdoors, getting the most out of your garden. Creating your very own outdoor lifestyle has never been easier and with the 2.5m building height affording you plenty of headroom, giving a spacious feel, you’ll never want to leave your BillyOh log cabin. Ensuring that your log cabin will be everything that you want it to be, we offer you a wide range of sizes and finishes so that you can pick the style that best suits you. However you wish to furnish and decorate the inside of your building, the tall double doors allow you to easily move your furniture and accessories in and out easily and the offset design of the doors offers maximum floor space away from the doors, allowing room for larger furniture items such as desks, gym equipment and soafs - whatecer you like!. 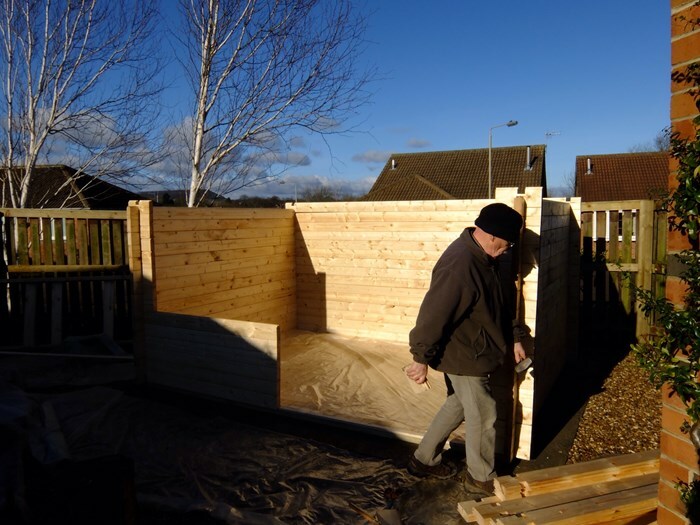 The cabin is a solid, interlocking structure made from Tongue and Groove cladding, giving stability and security to the building and its contents, with the option of a 19mm thick roof for even more protection. 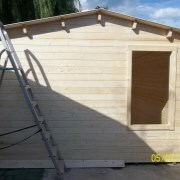 Depending on how you’d like to use your cabin, our various cladding options will meet all your requirements. 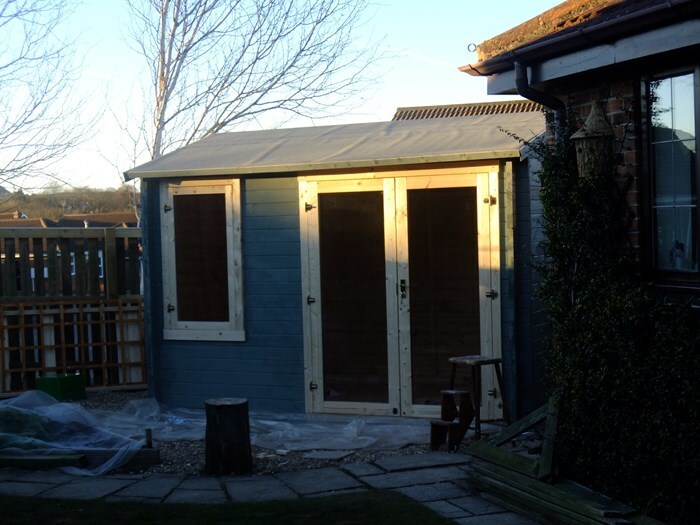 We offer 3 Tongue and Groove cladding thicknesses: 28mm, 35mm and 44mm, so if you wish to use your cabin solely as a summer house during the warmer months, or as an all year round retreat, with double glazing available, the log cabin can be fully customised around you. If a home gym is something you’ve always longed for, then the heavy duty 19mm flooring option is perfect for your heavy weights and equipment. 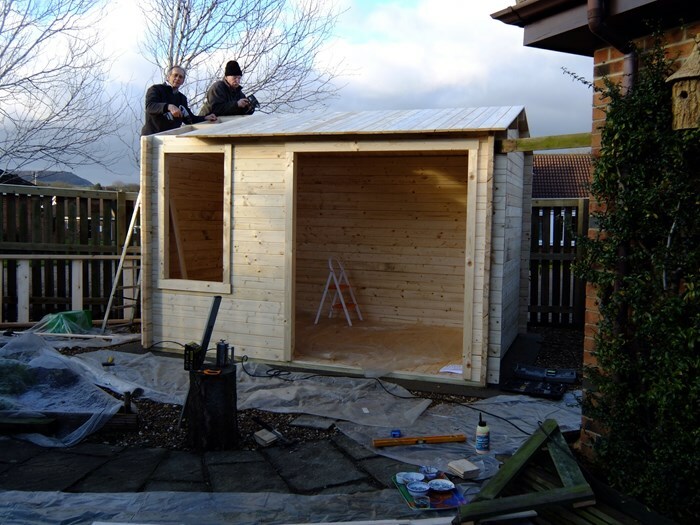 Giving you more durability and stability than a premium shed or summerhouse, with a BillyOh Devon Log Cabin you’ll be totally protected from the elements. Thick, interlocking 28mm, 35mm or 44mm cladding walls completely lock out the conditions making sure you’ll always be warm and dry in your outdoor building. Likewise, when the weather’s warmer, the beautiful, long windows and doors will keep you cool as you enjoy the summer sun. If you wish to be even more protected then we offer a selection of roof thicknesses. 11mm and 19mm roof thicknesses will keep any moisture out of your cabin keeping you dry and your belongings undamaged. We offer two flooring thickness options, so depending on how you’re going to use your log cabin, you can choose the better option for you. The first option is 11mm thick board that interlock together, providing you a solid base for basic use. If you’d prefer something more robust for more heavy duty use, such as a home gym, the upgrade option is a 19mm flooring that provides extra strength and durability to your log cabin. This upgrade option is perfect for housing heavy equipment and withstanding the knocks and spills of everyday life. 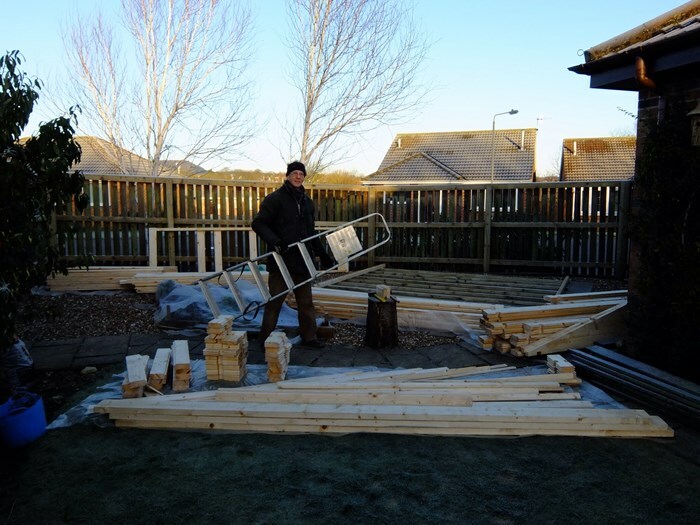 We supply timber bearers with both flooring options. For a completely protected building, you can also opt for a pressure treated building which is an effective way of keeping the building completely protected from the elements. The next step of customising your outdoor log cabin is to select the windows that best suit your taste. The beamed Georgian style windows provide a traditional, vintage British finish to your garden. The Modern, simplistic style windows give your cabin a contemporary style. Both window options are exactly the same dimensions, so whichever you choose you’ll have plenty of sun shining through, lighting up your cabin beautifully. If you wish to use your building as a summer getaway, the single glazing windows and doors will be perfectly suitable for you. The double glazing option we offer enhances the safety, and reliability of the cabin and also shuts the cold out; ideal if you’re looking for a cabin to use all year round. 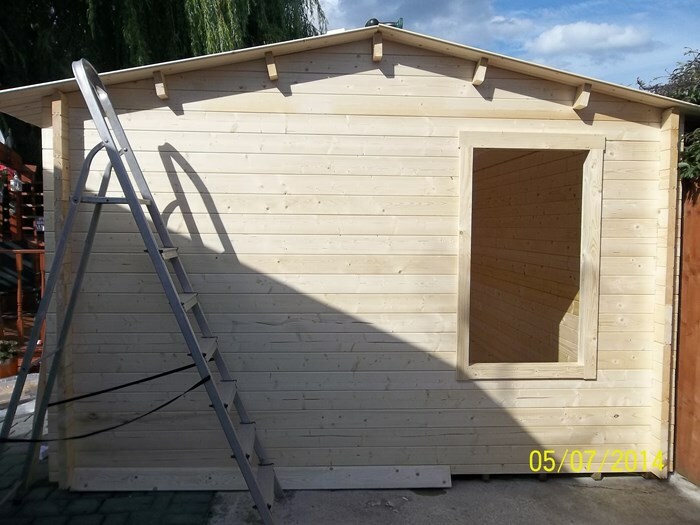 You can further customise and enhance the building by putting your own personal stamp on your new Devon Log Cabin by painting and decorating it. We recommend adding an annual treatment or paint to your cabin for the best weather and heat protection to keep it in its best condition and looking pristine for many years to come. Our premium paints come in a wide variety of colour choices that will bring your cabin to life, or for a more traditional look, we also offer a range of natural-look wood treatments. You can also choose your roof covering. If you want to make your own, the first choice is to have no covering, so you can build and customise your own cover, but we only recommend doing this if you’re an experience DIY person. The second option is to have the mineral felt, which is a strong, thick option that can withstand rain and protect the wooden roof. The third option is our roofing shingles that protect your roof from poorer weather, and also give a tiled look to the top of the log cabin, finishing off the styling beautifully. At 2.5m tall you have all the headroom you need to house tall furniture and equipment or hang lights in your cabin. The eaves, which are the lowest point of the roof, have also been raised to allow for a higher ceiling, keeping your cabin feeling fresh and airy. The tall 6’2” double doors give extra entrance clearance; perfect for adding and transporting furniture. This also prevents the need to duck down as you enter the cabin. 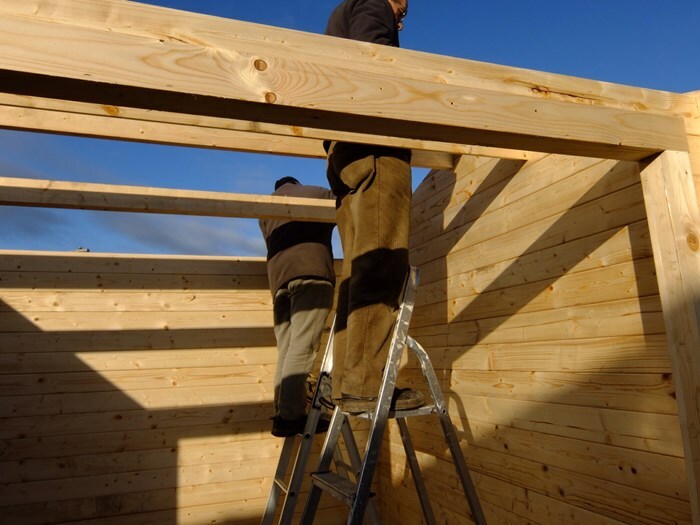 The BillyOh Devon range of log cabins has been designed at 2.5m tall to comply with most planning regulations. Dependant on location and intended use, planning rules vary, therefore we advise you to contact your local borough council for more information regarding planning permission and building use restrictions before purchase. Width 350.8cm 11'6" 413cm 13'7" 443cm 14'6" 353cm 11'7" 415.2cm 13'7" 445.2cm 14'7" 353cm 11'7" 415.2cm 13'7" 445.2cm 14'7" 505.2cm 16'7" 508.4cm 16'8" 505.2cm 16'7" 508.4cm 16'8" 568.4cm 18'8" 568.4cm 18'8"
Depth 282cm 9'3" 282cm 9'3" 282cm 9'3" 404.2cm 13'3" 404.2cm 13'3" 404.2cm 13'3" 465.9cm 15'3" 465.9cm 15'3" 465.9cm 15'3" 404.2cm 13'3" 391.7cm 12'10" 465.9cm 15'3" 465.9cm 15'3" 319.7cm 10'6" 465.9cm 15'3"
Eaves Height (Inc Floor) 209cm 6'10" 209cm 6'10" 209cm 6'10" 209cm 6'10" 209cm 6'10" 209cm 6'10" 209cm 6'10" 209cm 6'10" 209cm 6'10" 209cm 6'10" 203.4cm 6'8" 209cm 6'10" 204.8cm 6'9" 203.4cm 6'8" 204.8cm 6'9"
Ridge Height (Inc Floor) 247cm 8'1" 247cm 8'1" 247cm 8'1" 247cm 8'1" 247cm 8'1" 247cm 8'1" 247cm 8'1" 247cm 8'1" 247cm 8'1" 247cm 8'1" 249cm 8'2" 247cm 8'1" 249cm 8'2" 249cm 8'2" 249cm 8'2"
Door Opening Size (w x h) 156cm x 187.6cm 5'1" x 6'2" 156cm x 187.6cm 5'1" x 6'2" 156cm x 187.6cm 5'1" x 6'2" 156cm x 187.6cm 5'1" x 6'2" 156cm x 187.6cm 5'1" x 6'2" 156cm x 187.6cm 5'1" x 6'2" 156cm x 187.6cm 5'1" x 6'2" 156cm x 187.6cm 5'1" x 6'2" 156cm x 187.6cm 5'1" x 6'2" 156cm x 187.6cm 5'1" x 6'2" 156cm x 187.6cm 5'1" x 6'2" 156cm x 187.6cm 5'1" x 6'2" 156cm x 187.6cm 5'1" x 6'2" 156cm x 187.6cm 5'1" x 6'2" 156cm x 187.6cm 5'1" x 6'2"
Width (Internal) 323.4cm 10'7" 383.4cm 12'7" 413.4cm 13'7" 323.4cm 10'7" 383.4cm 12'7" 413.4cm 13'7" 323.4cm 10'7" 383.4cm 12'7" 413.4cm 13'7" 473.4cm 15'6" 468.2cm 15'4" 473.4cm 15'6" 468.2cm 15'4" 528.2cm 17'4" 528.2cm 17'4"
Depth (Internal) 233.4cm 7'8" 233.4cm 7'8" 233.4cm 7'8" 323.4cm 10'7" 323.4cm 10'7" 323.4cm 10'7" 413.4cm 13'7" 413.4cm 13'7" 413.4cm 13'7" 323.4cm 10'7" 318.2cm 10'5" 413.4cm 13'7" 408.2cm 13'5" 318.2cm 10'5" 408.2cm 13'5"
Window Dimensions 72cm x 125cm 2'4" x 4'1" 72cm x 125cm 2'4" x 4'1" 72cm x 125cm 2'4" x 4'1" 72cm x 125cm 2'4" x 4'1" 72cm x 125cm 2'4" x 4'1" 72cm x 125cm 2'4" x 4'1" 72cm x 125cm 2'4" x 4'1" 72cm x 125cm 2'4" x 4'1" 72cm x 125cm 2'4" x 4'1" 72cm x 125cm 2'4" x 4'1" 72cm x 125cm 2'4" x 4'1" 72cm x 125cm 2'4" x 4'1" 72cm x 125cm 2'4" x 4'1" 72cm x 125cm 2'4" x 4'1" 72cm x 125cm 2'4" x 4'1"
Front Roof Overhang 27.8cm 11" 27.8cm 11" 27.8cm 11" 27.8cm 11" 27.8cm 11" 27.8cm 11" 27.8cm 11" 27.8cm 11" 27.8cm 11" 27.8cm 11" 27.8cm 11" 27.8cm 11" 27.8cm 11" 27.8cm 11" 27.8cm 11"